Previously known as the Captain Marvel of DC Comics, Shazam was created in 1939 as the alter ego of young boy Billy Batson. By shouting out the magic word that would become his namesake, he transformed into a superhero imbued with the powers of mighty heroes of myth, including Solomon, Hercules, Atlas, Zeus, Achilles, and Mercury. This ultimate hero wears a red and yellow costume emblazoned with a lightning bolt, complete with billowing cape. At Superheroes Direct, we honor this historic superhero with a variety of collectibles and apparel, including t-shirts for both children and adults depicting Shazams lightning bolt logo. Keep checking back for additions to our selection of Shazam merchandise here at Superheroes Direct. The embodiment of a dream for all children who love comics, Shazam is simply an ordinary boy who can transform into an adult superhero at a whim. The Kids Shazam Logo T-Shirt is designed to emulate the look of this hero. 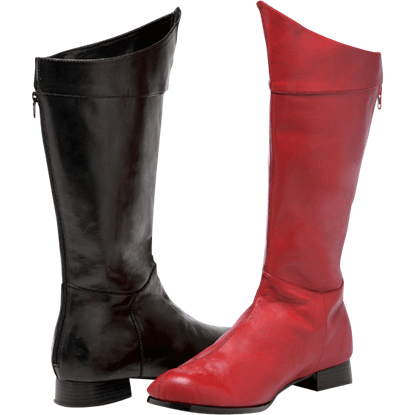 For an electric charm that every superhero and villain needs, the Striking Hero Boots are just the ticket! 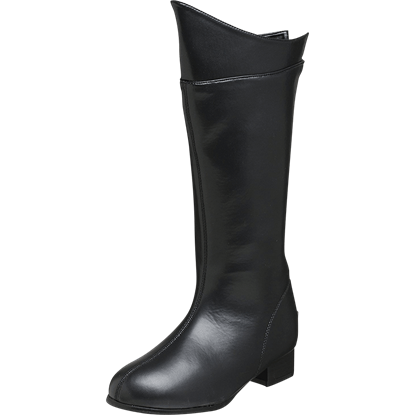 Made of faux leather with synthetic soles, these comfortable boots are the best way to complete your powerful ensemble!